Note: Click on pics to open for larger view. There was a thread started by wlmoore on the TreoCentral Palm Foleo forum back in June. wlmoore asked if anyone had gone to the Palm Foleo Sneak Preview in Sunnyvale. Andre Kibbe, who is Gameboy70 in the forums, responded that he was going over to the Palm Retail Store in The Grove in Los Angeles for their Sneak Preview that afternoon on June 21st. When Palm first announced the Foleo on May 30, my only exposure to the company's "third product category" was limited to a quick reading of TreoCentral's article, "Palm Announces Foleo". Without reading further, I was hooked. I also knew that until it hit the market, it would be a hard sell. My positive reaction was atypical, to put it mildly. The Foleo's reception has been overwhelmingly one of rejection. So why not conclude, with the general consensus, that this so-called "mobile companion" is a solution in search of a problem? As a former owner of an instant-on solid state laptop, the Psion Series 7, I've longed to have the same speed and responsiveness in a newer device for years. So when the Foleo was introduced, the earlier solid state device was my reference point. It was pretty easy to ignore much of what Palm had to say about their own product. Still, I wanted to know more: the specs, the release date, details on what software would be available. But mainly I just wanted to know what it would be like to use one. As providence would have it, last Wednesday I checked the TreoCentral forums while standing in line at a Jamba Juice and came across a new thread stated by wlmoore, "Palm Foleo Sneak Preview? ", where I serendipitously discovered that Palm was giving a live demo of the Foleo later that evening at a Palm Retail Store just six blocks away. I called to confirm the event, and was told that it was fully booked. So I did the sensible thing and went anyway. Instead of an audience presentation, Palm simply had three stations displaying Foleos, each with a Palm employee flown down from their corporate headquaters in Sunnyvale. The units weren't fastened in place, nor were they connected to a power source at any time throughout the evening. Although it would have been nice to see the Foleo's charger for once, the untethered display did drive home the notion that you could leave the charger at home with confidence. The staff was very open about allowing attendees to handle the device as they saw fit. I wasn't prevented, for instance from going to the Terminal app and running vi (Unix's default text editor, pronounced "vee-eye") or viewing the contents in the Foleo's directories. Nor was I stopped from taking pictures with the only camera I had on hand, the 755p. I expected the Foleo to be smaller than it was, and was pleasantly surprised. The base of the unit is particularly thin, perhaps 7mm. The pewter finish is quite elegant, distinguishing it from plastic casings, not unlike a Titanium Powerbook. The exterior, despite its muted metallic look, did not feel cold to the touch. It seems to have some kind of coating that gives it a softer tactile complexion than a first glance would suggest. The weight measures in at 2.5 lbs on paper, but psychologically it feels dramatically lighter than a typical laptop. When held, the Foleo feels more like a book than a laptop: the weight rests in your hand rather than distributing itself over the length of your arm and shoulder. You can perceive heat with your fingers at the base of the unit after half an hour of continuous use, but it doesn't run hot in your lap. The hinge is very well designed. You can lift the lid while the base rests on a surface, and the base will stay in place. Conversely, you can leave the lid at any angle, and it will stay in place without gradually succumbing to gravity. Unlike my HP Pavilion, which also lacks a latch, the Foleo actually does stay shut when closed. "the power adapter for the Foleo is the same size as my Treo adapter. I usually leave it at home when I take the device with me for the day, and so far, it's not gone dry." Unless there's a configuration in Preferences to do otherwise, you have to use the power button to activate the Foleo, as opposed to just opening the lid, which would have been nice. On the other hand, closing the lid turns the Foleo off, and the current state of edit of any document in progress is automatically saved. For some reason there was no WiFi signal in the Palm Store (!) to see the wireless mode in action. Two of the units were pairing with 755p models, the third unit was paired with a 750 which didn't have a DUN profile enabled. So the latter unit remained completely offline while the other two were connecting to the internet exclusively by DUN. It was still reasonably fast. At times the two functionally networking units had to be reconnected, which I attributed to a predefined timeout. In hindsight, it probably had to do with closing the lid. Except for DUN and one brief demo of synching with Versamail, most of the functionality of the Foleo was completely independent of the smartphone. Unfortunately the Foleo's Versamail client is currently limited to synchronization, not direct POP/IMAP access over WiFi. Obviously it's possible to access web-based email through Opera, but for a product ostensibly optimized for email power users, this is a serious drawback, hopefully one that is short-lived. Despite being told that one of the Palm reps on location was an engineer who could answer some of my technical questions, I never found her. I particularly wanted to find out more about the full extent of the Foleo/Treo relationship. I could not get a straight answer, for instance, on whether or not OBEX Bluetooth file transfer profile is supported. My most persistent criticism of the Foleo has been the lack of a native PIM suite. Leaving something as fundamental as PIM development to third parties was too inexplicable to go unchallenged. It was even less explicable when presenters volunteered that they and more than a few employees at Palm -- not just developers, but rank-and-file management, sales and marketing staff -- were carrying around and using Foleos for up to two years. Nobody had an occasional urge to look his or her calendar? It's hard to believe that in two years of usage, no one found the lack of calendar synchronization to be a serious issue. Hopefully, Palm will license mDayscape from MotionApps and put it in ROM, but from what I was told that evening, the Foleo will ship without it. Navigation on the Foleo takes some getting used to. While I think Palm's insistence that the Foleo is not a laptop has left the public more confused than illuminated, there's some truth to the assertion. The Foleo is operationally more like a large PDA than a platform using a desktop OS, including UMPCs. Programs launch instantly, and instead of closing or minimizing them, you just launch a new program, and the current state of the previous program is saved. 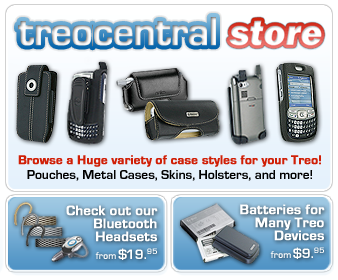 To return to the previous program you simply relaunch it, just as you would on the Treo. Consequently, there is no need to Alt-Tab between programs. As far as I could tell, there were no desktop icons to click for launching apps. They seem to be launched exclusively with the Apps menu. You can use the trackpoint to navigate through menus, which I personally found rather stiff, until I realized in hindsight that I always maximize the cursor speed on all of my computers to cover more screen with less effort, and could have done the same here. You can also navigate using the Apps button, followed by a shortcut key for the app in question. To launch Word to Go, for instance, you would hit Apps, then W. Each shortcut key is a single letter, displayed immediately to the right of each app on the menu. Menus within each application follow a similar design, using the Menu key just to the right of Apps. The scroll wheel is a nice touch, though I wish it were slightly wider to keep my thumbs from colliding. In Versamail you can use the wheel to highlight email headers. By holding the Shift key while using the wheel, the focus changes to the lower pane to scroll up and down the body of the selected email. The implementation was very well thought out, and I look forward to seeing how it operates within newer programs. The Opera browser's implementation on the Foleo is pretty basic. By now, everyone knows that it lacks tabbed browsing. When I asked about this I was told that it was a speed issue. Anything that potentially adds bloat is scrapped, or as the Palm employee put it, "We're measuring everything in milliseconds." Sorry, but I still want my beloved Firefox, even at the expense of extra milliseconds. There were no rendering problems on the few sites I visited or saw others visit that could really test the browser's robustness. I recommend that anyone attending the upcoming previews at other Palm Stores do what I forgot to do, and test the Flash, H.264 and Quicktime video streaming. Palm's custom UI is slicker than a typical Ubuntu/SuSE Linux distribution using KDE or Gnome. Previously I assumed that the graphical layer would avoid X11 altogether and use something with more commercial sheen like DisplayPDF. I still don't know what desktop toolkit they're using, but it doesn't look like GTK or QT. In hindsight I should have tried poking around for config files in Terminal, but my impression is that it's a newer, more lightweight toolkit over X, in which case porting existing Linux desktop apps to the Foleo would not be too onerous. So how is the Foleo overall? I think a better question is: Who is it for? It is not for professionals whose daily laptop usage involves an industry-specific application. For CPAs using Quickbooks, architects using Revit, and filmmakers using Final Cut from day to day, the Foleo is simply redundant. They need to run their primary software tools every day, and cannot leave their laptops behind. In its current phase, the Foleo is for those of us who need the most generic computing functionality -- email, document editing, web access -- without carrying the excess baggage of additional functionality used occassionally. The Foleo is hardly a mind-blowing experience. More than the hardier specs that critics are clamouring for, it needs a more robust suite of bundled apps to validate such an expensive purchase, not the least of which is (surprise!) the Palm Desktop. Only when thinking about going back to carrying a laptop after using the Foleo does its value begin to sink in. All of a sudden, the size, weight, noise and heat of a typical laptop start to become less acceptable. The ritual of walking into a cafe and looking for a power outlet becomes peculiar. Unless you fall into the first category of users, who need their specialized kill app close at hand, you reach a tipping point, where instead of questioning the need for the Foleo, you start looking for reasons to leave the laptop at home.